Decades ago, a group of scientists and entrepreneurs set about to lead the human race towards a new industrial domain entirely. This was the very beginning of asteroid mining. No longer would we rely solely on the resources found on our one planet. Nor would we need to worry about harming its fragile environment. We could finally set the world onto a path towards health and harmony. But asteroid mining has its limits. Not every material we need, or want, can be found in the Forza Asteroid Field. The time has come for us to reach even farther out in our solar system. Colonization and terraformation are well on their way on the third planet, but those resources belong to the Keresites, and it would be morally objectionable to use them. If we take them unlawfully, we risk war. If we form some kind of trade agreement, then we may be dooming the Keresite descendants to a future riddled with pollution, and other environmental concerns, the likes of which we experience here. Some have expressed interest in exploring the first planet from the sun, but all attempts have either failed, or been cancelled. So, what other options do we have? Well, we call it Darrow; after the discoverer’s daughter’s childhood imaginary friend. Located just beyond Forza, Darrow is what’s known as a heavy world. It’s much more massive than Keres, or our planet, but still smaller than the gas giants, or the outer ice planets. Darrow has a stronger atmosphere than Keres, and even a magnetic field. In order to breathe on Darrow, a human would need specialized oxygen equipment, and a few regular acclimation injections, but would otherwise be fine. The real problem with Darrow is that it’s just too massive. The gravity is so high that a normal human being would not be able to survive. Even transhumanists with certain body modifications would have a hard time moving around. They would simply weigh too much for it to be a practical endeavor. Scientists at the company UI but a few months ago completed the final stage of creating an entirely new race of peoples. They are tentatively known as dwarves, but representatives from the company say that name may change, as it has already sparked some confusion with Saratta, the tenth and outermost planetoid in our system. It is sometimes known as the dwarf planet. Dwarves, as in the biological kind, have been genetically engineered to survive on Darrow. They have two sets of lungs, each of which is tailored to the composition of one of the atmospheric planets in question. They are short and sturdy, which gives them the ability to tolerate their own weight on Darrow. The dwarves will be sent to form a new colony, with mined materials being their primary export. Some on social media have expressed outrage over the development. There appears to be two major concerns. The first is about the morality involved with genetic engineering in the first place. An unborn entity cannot give consent to be born differently. Ivor Leonardson’s granddaughter and actress, Showboat Sharon had this response: “neither can anyone else, [expletive deleted]s.” The other major problem with this project—and one that holds a little more water—is how questionable it is to create a race adapted for the planet they weren’t born on; move them to it, as if they have any legitimate choice; and then ask them to do a particular kind of work that hypothetically not one of them wants to do at all. 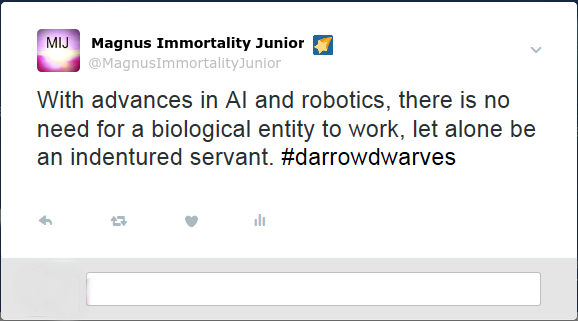 One commenter, @MagnusImmortalityJunior pointed out, “With advances in AI and robotics, there is no need for a biological entity to work, let alone be an indentured servant. #darrowdwarves”. The Confederacy is already loading up the court system with inquiries into the company’s newest enterprise; this on top of the mountains of litigation that UI is already going through. Hearings are set to begin next week. The UI spokesman, Fred Rinter has declined to release an official statement regarding the organization’s legal troubles.